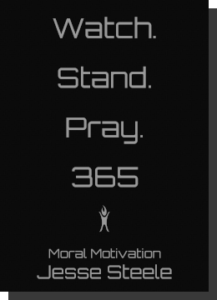 It’s been about a month since it was released: Watch Stand Pray 365. It’s in Amazon paperback and Kindle, and the first 1,000 are free in most other ebookstores. I was inspired by what people said about Jordan, though I had never once heard him talk. Except one short critique on his now-famous interview, I had never see or heard one word from Jordan. That was to make sure the book wasn’t the least bit tainted. Now that I’m finished and am listening to Jordan, I see he and I had a lot in common in our thinking.